Maid of Secrets comes out today, and I’m thrilled to share my thoughts on this engaging, historical tale that captured my imagination and made me long for a sequel. I was lucky enough to receive an ARC a few months ago, and as a dyed-in-the-wool history nerd, always on the alert for original perspectives from long ago that are told from a strong female point-of-view, I was salivating at the chance to read this book. The story takes place in the unstable court of Queen Elizabeth I’s early years. As a young female monarch, her power and life is threatened at every turn, were it not for an elite group of spies that masquerade as ladies-in-waiting to Her Majesty. Scouted across London, for their various hidden talents, with skills ranging from manipulation, languages, code breaking, to stealth, is a group of women who wield intelligence in place of swords. We meet the heroine, Meg, after she is forcefully recruited when she steals from the queen’s spymaster, for her sleight of hand and perfect ability to recall all conversations. She embarks on a rigorous new life transforming from a traveling theater performer/pickpocket to trading in secrets, in order to protect Queen Elizabeth. While I was completely engrossed in the story’s vivid period details, romantic interludes with hot Spaniards, swift plot, and the mysterious allure of Tudor intrigue, two things that really stood apart for me were Meg’s independent spirit and the complicated, flawed relationships of the maids. Meg is reluctant to give up the freedom she experienced on the streets of London, even if it is in exchange for elegant frocks and access to the royal court. She’s clever and makes the best of her situation, to survive the chaos and nest of lies that haunt Queen Elizabeth, and finds herself developing an uneasy respect for the free-willed sovereign, despite the fact that she is now her property and can be married off at a moment’s notice. I loved how Meg reconciled her opposing feelings towards the queen; it wasn’t simply a matter of blind hero worship, she sees her as a woman making difficult choices in an impossible age. Both Meg and the queen, are firm in their convictions, valuing independence above all else, reminding me of Katsa from Graceling. The maids are nothing like a gaggle of sorority girls. These girls don’t make Meg’s entrance in to the group easy, they don’t shower her with false smiles and help her with her studies, but neither are they ‘mean girls’; they wait for her to prove herself. They are young women who were all compelled in to their roles for one reason or another, and as a result the friendships that do end up evolving between them are that much more authentic, the esteem that develops between them more precious, because it was earned instead of freely given. Perhaps it’s because traditional historical accounts so rarely focus on women, that when I find a story in this vein, I devour it! 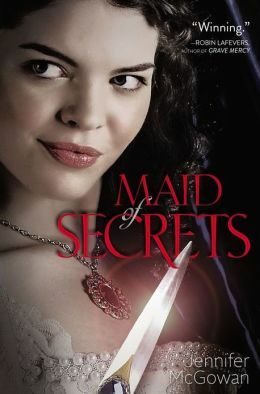 Jennifer McGowan’s Maid of Secrets perfectly sated my appetite. It was invigorating to read a book where complex female relationships are at the heart of the action, and I can’t wait to see what happens to Meg, the other maids of honor, and the Queen, next. This looks really good! I will have to give it a try. You definitely should! It was a great read, totally took me by surprise.